Welcome to the online home of Northeast Regional Education Cooperative (REC#4). Established in 1984 by the New Mexico State Department of Education, REC#4 is one of nine regional education cooperatives in New Mexico. REC#4 provides training, technology assistance, administration support, grant administration, and other services to six public school districts. 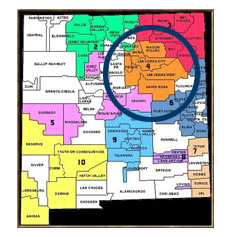 Located in Las Vegas, New Mexico, REC#4 serves the Pecos, Mora, Santa Rosa, Wagon Mound, West Las Vegas, and Las Vegas City school districts. Our organization is designed to provide resources and support to our member districts as well as the families served by those districts. We offer specific programs and services for our teachers, a resource library, helpful resources for parents, and much more. Please browse through our website for any information you may need, or download our informative brochure. Feel free to contact us if there’s anything you cannot find on the pages of this website. There is a NEREC council meeting on Wednesday, April 3, 2019. At NEREC, we are dedicated to providing professional development, resources, parent assistance, personnel recruitment, and so much more to the districts and families within our cooperative’s boundaries. We invite you to visit the websites of the districts that help to make up NEREC. November 1, 2018 - FERPA and Related Service Providers-Elena Gallegos, Esq.